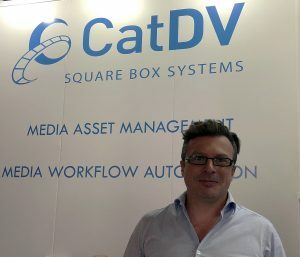 At IBC 2018, Square Box Systems rolled out new and updated features for its flagship CatDV media-asset–management solution, including the launch of AI features (previewed at NAB 2018 in April) for speech-recognition and image analysis, ingest capabilities from S3 object-based storage, a new notifications service for multisite/multi-user workflows, and more. During the show, SVG sat down with CEO Dave Clack to discuss these new features, why he believes AI will fundamentally change the MAM sector, why ingest from object-storage is key for CatDV users, and more. What is the main focus for Square Box Systems at IBC 2018? We are focused on three main things here: AI, ingest from object storage, and the overall product evolution of CatDV. First off, how has the market reacted to the AI features introduced at NAB 2018, and is there any new news on that front? Number one is AI. After we got such great feedback at NAB about the six integrations we’d done to demonstrate AI and CatDV — which were image tagging, video tagging, and speech for both Google and Microsoft — we are continuing to expand on that. Those [features] have launched, they’re built into our high-end server, and they’re no extra cost. We think [AI] is going to fundamentally change the industry: AI needs asset management, and asset management has been looking for AI for a long time. We’ve been starved of metadata forever, and now we’ve got a deluge of it, but we need to be able to make sense of it. So that’s massive change. We’ll continue to listen to our customers and work with partners like Google, Microsoft, IBM Watson, and others to [serve their needs]. How are you making CatDV object-storage–friendly, and why is this important for the platform? The other big one for us is ingest from cloud and object storage, and we now have an [integration] that is live with Spectra Logic around that. Spectra Logic’s Black Pearl [converged-storage system] uses object storage, and we can ask the Black Pearl, and you can now seamlessly ingest those object parts into CatDV – just like if you had just been watching the file system. What that means is, you can now ingest from the cloud — such as [AWS] S3 and more to come — right into CatDV and, at the very least, we could restore that content. Once you can restore it, then we can automate it. You might have a million assets already on your Black Pearl or on S3, but you want to find the stuff that’s got this date in the file path. Then you just send it off to AI and, in an automated fashion, find and enrich all this content that you couldn’t find previously because it was just thrown into the cloud since it had infinite storage. And what are the other new CatDV capabilities being introduced here? Yes, we’ve got new product-evolution features, and there are a lot of them. I think the most notable is the notifications service that we’re introducing, which means that all the different [tools in] CatDV can communicate immediately. The automation engine can give progress updates. Or, if someone in Hong Kong is changing some metadata, it will automatically get updated to anybody that happens to have it opened somewhere else. The next version of CatDV is also going to be fully 64-bit, which means faster transcodes, faster playback, better HD, better 4K. How does the M&E sector’s increasing interest in object-based storage impact CatDV, and why do you think the market is moving that direction? One of our strengths is, we make really complicated storage look simple. We handle all the logistics behind the scenes whether [your content] is on LTO, LTFS, Tier 2, Tier 1, object storage, cloud storage, whatever. Our job is just to get the right stuff into the right creative people’s hands at the time they need it. So we have a nice, simple web interface that simplifies the massively complicated storage landscape in a cost-effective manner. We are just extending that with [the object-storage integration]. We also know that people buy storage and fill it up before they think about asset management, so we are looking to help fix that problem. If they have gazillions of tapes in Black Pearl or loads of [content] on S3, we’ve got to be able to bring that into our system and make that [media] usable. We’re trying to be the best [MAM] in the world at being a hybrid cloud/on-premises provider, so people have choices. We don’t insist, like some of the vendors, that everything must be in the cloud. In the end, it’s totally up to you. AI and machine learning have been the most hyped tools in the broadcast industry in 2018. What are the specific AI-powered tools that can be used today in real-world content-management scenarios? One of the main technologies usable today, in our opinion, is speech-to-text. Now, speech-to-text [AI engines] are still rather poor quality, so it is not necessarily a [reliable] transcription or captioning tool yet. But, even if you just run [mediocre] speech-to-text and get what you can get out of the AI, that often unlocks your ability to search. So no good for transcription and captioning,= but not bad for search. Speech-to-text is very dependent on the quality of the recording, which is traditionally quite good in a sports environment. Imagine you have a large catalog of [tapes] that you are looking digitize. You can run it through some AI and immediately get some value out of it using speech-to-text. So we see speech to text as the most practical [AI tool] today, despite its limitations.